I took this photo at 9.30PM last night. 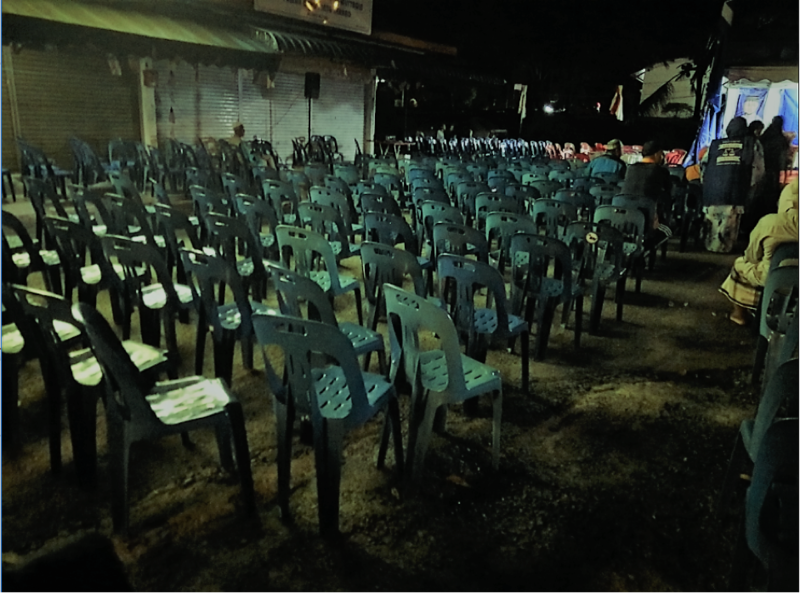 It shows all the empty seats at the Barisan National ceramah at near the Jalan Meru mosque, Jalapang, Ipoh. The BN provided a few hundred seats only 10% of the seats were occupied. Let us look at recent history and trends in Perak. Firstly, it is a fact that in the last election the opposition won a handsome 55.14% of the popular vote in Perak compared to BN which only managed to get 44% support. In other words, the current BN state government is really a minority government which does not have the support of the majority of voters in Perak. In terms of the number of seats, out of 59 state seats, BN had 31 seats compared to the opposition which had 28 seats. This shocking result occurred due to the blatant gerrymandering by the Election Commission which has been a tool of the Barisan government in every election since Merdeka. Despite the electoral dirty tricks, it is important to note that it will require a swing of only 2 state seats in order for the opposition to take over from BN. Further if you study carefully the 31 state seats won by BN, there are more than 10 seats where the margin of victory is razor thin – that is, less than 500 to 1000 votes. What this means is that in the coming general election, if Pakatan Harapan can maintain their previous support and manage to bring in another 5% extra support from the voters, no amount of gerrymandering and dirty tricks can save the BN from losing the state. When the Perak voters go to the polling booth soon, it is important for them to take note that under the current BN state government, Perak’s socio-economic situation has gone from bad to worse. The latest government owned Khazanah Research Centre report shows that Perak is now the second poorest state after Kelantan Darul Naim. This may appear shocking and unbelievable. After all, in the past, Perak has always been one the richest states in the country. But it is true. The Prime Minister’s statistics department figure shows that 2/3 of the people in Perak earn less than RM5,000 per month and the state household income is less than the national average income. The pathetic state of affair is made worse by the fact that according to the 10th Malaysia Plan, Perak is now the state with most number of poor families. 122,000 households in Perak earned less than RM2380.00 per month and they comprised 12.2% of the national record. This poverty figure is even worse than Sabah & Sarawak. It is not only the hard data and statistics that paint a miserable picture of the current BN state government. When I speak with fellow ordinary Perakians, they complain that decent jobs opportunities in Perak have dried up and are so scarce that most of the youth are forced to leave the silver state in order to earn a living. It is a damning indictment of Zambry’s administration that many have been forced to leave their family and hometown to pursue a living in Klang valley, Penang, Singapore or other countries. The latest National Migration report reinforces my critique. The report notes that Perak is the state which has suffered the most brain drain in our country. According to it, 9800 people left the state in 2016 and plan not to return if no positive changes are made in the foreseeable future. What a shame. The current BN state government is not only incompetent, it also operates without transparency and accountability. It is shocking to see that Perak Menteri Besar Incorporated, (MB Inc) has failed to table their audited account in the state assembly for more than 5 years since 2012. In other countries, such a scandal would have resulted in the sacking of the Chief Minister but not in Perak. Recently it was revealed in parliament that the state government had allocated a 50 acre piece of land located on ex mining pond to build the new hospital in Kampar. Such incompetency has made Perak a laughing stock. As a result of the state government’s stupid mistake, the health ministry was forced to cancel the RM150 million hospital project as the cost to fill up the ex mining pond is clearly too expensive. Obviously the people of Kampar have been cheated once again. Similarly, the promise by the BN government to build a new hospital at Sri Iskandar & “special economic zone” for Kamunting & Kampar to date still remain empty promises made during election time. Expect more BN empty promises coming again soon. Based on the above, if there are still people who refuse to vote for change, I can only suggest to them that they should get their brain examined. I am confident Pakatan Harapan will be able to swing the extra 5% support especially since they have Tun Dr Mahathir as their candidate for Prime Minister now. As for PAS I am sure that they will do badly. Many Perakians are disgusted that PAS is only interested in playing a spoiler role and are secretly in cahoot with Najib. A vote for PAS is a vote to save Najib, so please do not waste your precious vote. At the same time, those in Perak can see that the former Menteri Besar Dato Seri Ir Nizar bin Jamaluddin is still very active and is continually working very hard on the ground despite the past setback. In his short stint as Menteri Besar, Nizar has shown himself to be an open minded, progressive & a professional leader. In addition, DAP Perak is led by chairman Nga Kor Ming who is very pragmatic and dynamic. Many do not realize Pakatan HARAPAN in Perak has one of the most solid and cohesive coalitions compared to other states. They have a secretariat, conduct regular meetings and do planning together. I am confident that they will do well in government. But for Pakatan to revive and revitalize Perak, it is important that every Perakian shows up at the voting booth to kick the cronies of the kleptocracy leader out of power. GE 14 is on 9 May, only 5 days more for us to cast our votes. I am already 85 years old and with my long experience in doing business, I can help Perak establish our former glory as the richest state in Malaysia. Kali ini lah! If Pakatan Harapan wins, will there be a repeat of May 69 and the Bumiputera policy? Why should MCA interfere with Utar?